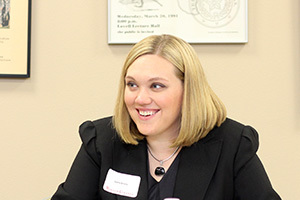 Wabash College professor Sara Drury will receive the Top Paper award in Argumentation and Forensics from the Central States Communication Association (CSCA) at the group’s convention in Madison, WI, on Saturday, April 18. The award honors the write-up of the research study, “Spheres of Argument in Undergraduate Biology Classroom Climate Change Deliberations,” a collaboration with co-authors and Wabash students Adam Burtner ’17, and Terry Majors ’15. The paper is an exploration of how participants in small group public deliberation used personal, technical, and public argumentation. This research helps understand more about structuring and facilitating public deliberation, and particularly about some of the disconnects between personal stakes in deliberation and technical information. Dr. Drury has published essays in "Journal of Communication & Religion, Voices of Democracy," and in "What Democrats Talk about When They Talk about God." She also teaches several different courses including public speaking, classical rhetoric, and presidential rhetoric. Additionally, Burtner and four other Wabash students will present papers at the CSCA’s Undergraduate Honors Research Conference this weekend in Madison. The papers were competitively selected and will be presented in roundtable and poster format. Wabash papers include “The Stories and Messages of the Library of Congress,” by Kyle Stucker ’17; “Community or Catholicism: Georgetown's Response to the Contraception Controversy,” by Mason Zurek ‘16; “The Election of 1896: Bryan's Whistlestop and McKinley's Front Porch,” by Patrick Bryant ‘16; and “Planning and Analyzing a Public Deliberation Event,” by Burtner and Macallister Norton ’17. The Central States Communication Association (CSCA) is a professional, academic organization of primary and secondary school teachers, students, college and university professors, and communication professionals. CSCA was founded in 1931 to promote the communication discipline in educational, scholarly, and professional endeavors.